The boat races during the Dragon Boat Festival are traditional customs to attempts to rescue the patriotic poet Chu Yuan. 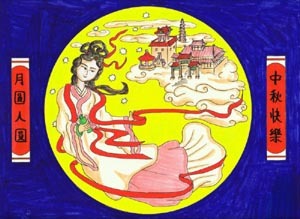 Chu Yuan drowned on the fifth day of the fifth lunar month in 277 B.C. Chinese citizens now throw bamboo leaves filled with cooked rice into the water. Therefore the fish could eat the rice rather than the hero poet. This later on turned into the custom of eating tzungtzu and rice dumplings. The Chinese New Year extends from the mid-twelfth month of the previous year to the middle of the first month of the new year. The New Year is a time to rush back home for a family reunion from all parts of the country. Days before the New Year, every family is busy giving its house a thorough cleaning, hoping to sweep away all the ill-fortune there may have been in the family to make way for the wishful in-coming good luck. People also give their doors and window-panes a new paint, usually in red color. They decorate the doors and windows with paper-cuts and couplets with the very popular theme of "happiness", "wealth", "longevity" and "satisfactory marriage with more children". Paintings of the same theme are put up in the house on top of the newly mounted wall paper. In the old days, various kinds of food are tributed at the alta of ancestors. The Eve of the New Year is very carefully observed. Supper is a feast, with all members coming together. One of the most popular course is jiaozi, dumplings boiled in water. "Jiaozi" in Chinese literally mean "sleep together and have sons", a long-lost good wish for a family. After dinner, it is time for the whole family to sit up for the night while having fun playing cards or board games or watching TV programs dedicated to the occasion. Every light is supposed to be kept on the whole night. At midnight, the whole sky will be lit up by fireworks and firecrackers make everywhere seem like a war zone. People's excitement reach its zenith. Very early the next morning, children greet their parents and receive their presents in terms of cash wrapped up in red paper packages from them. Then, the family start out to say greetings from door to door, first their relatives and then their neighbors. It is a great time for reconciliation. Old grudges are very easily cast away during the greetings. The air is permeated with warmth and friendliness. During and several days following the New Year's day, people are visiting each other, with a great deal of exchange of gifts. 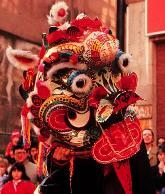 The New Year atmosphere is brought to an anti-climax fifteen days away where the Festival of Lanterns sets in. It is an occasion of lantern shows and folk dances everywhere. One typical food is the Tang Yuan, another kind of dumplings made of sweet rice rolled into balls and stuffed with either sweet or spicy fillings. The Lantern Festival marks the end of the New Year season and afterwards life becomes daily routines once again. This description is based upon the recollection of my own experience. Customs of observing the New Year vary from place to place, considering that China is a big country not only geographically, but also demographically and ethnically. Yet, the spirit underlying the diverse celebrations of the Chinese New Year is the same: a sincere wish of peace and happiness for the family members and friends. Once upon a time, there was nine suns on Earth, it was so hot and dry all the people in the kingdom suffer a great deal, a strong and brave general with great skill at bow and arrow decide to shoot down eight of the suns to relieve everyone's suffering in China. People respected him and advocated that he be the king. After he became a king, he was absorbed in drinking and having fun only. He lost his good character. His beautiful wife, Ch'ang Erh, worried about him very much and try to gave him advice. But the general always forgot the advice and continued to only care about having fun and nothing else each day. The general loved the power of the king, and he wanted to live forever. One day he asked a medicine to help him to live forever, the medicine man invented a very special pill which was made of rare material. The general cherished it very much and plan to take the medicine on August 15 of the lunar calendar. Ch'ang Erh found out about his plan and thought that if her husband took the medicine, common people would suffer forever. In spite of the fact that she loved her husband, she couldn't let this happen to the people. On August 15, she stole the medicine and took it while her husband paid attention to a dance show. When the general found out, he was shocked and before he can responded to it, a most unusual thing happen to Ch'ang Erh, she turn into an angel and floated up into the sky and head toward the moon. The general burst into tears. He was too shocked to believe it. His subordinate bring him a letter which was found in Ch'ang Erh's room address to him. He read the letter and finally realized the thoughts of Ch'ang Erh. He regretted his behavior but it was too late to realize. He made up his mind from then on that he will be a good king and led his people to a happier life. The general missed Ch'ang Erh very much and wondered where she went. He hoped that Ch'ang Erh knew about his change and forgave him. Actually, Ch'ang Erh drifted to the moon and lived in the moon. She know about her husband's change. She thought she did the right thing. People knowing the whole story and appreciated what Ch'ang Erh for them, so to honor Ch'ang Erh, people decided August 15 will be the Moon Festival in order to commemorate Ch'ang Erh. Until now, the Moon Festival is one of the most important festivals along with Chinese New Year and the Dragon Festival. During full moon on August 15 of lunar calendar, we always eat Moon Cake, watch the full moon and imagine what Ch'ang Erh's life in the moon is like at the Moon Festival.